Over a year after his marriage to Olori Wuraola crashed, the Ooni of Ife, Oba Adeyeye Ogunwusi has found a new bride. 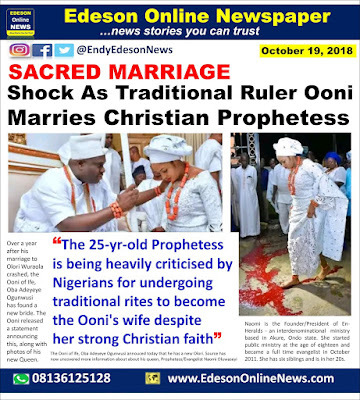 The Ooni released a statement annoucing this, along with photos of his new Queen. The Ooni of Ife, Oba Adeyeye Ogunwusi annouced today that he has a new Olori. Source has now uncovered more information about about his queen, Prophetess/Evangelist Naomi Oluwaseyi. Naomi is the Founder/President of En-Heralds - an interdenominal ministry based in Akure, Ondo state. She started public ministry at the age of eighteen and became a full time evangelist in October 2011. She has six siblings and she is 25 years old. 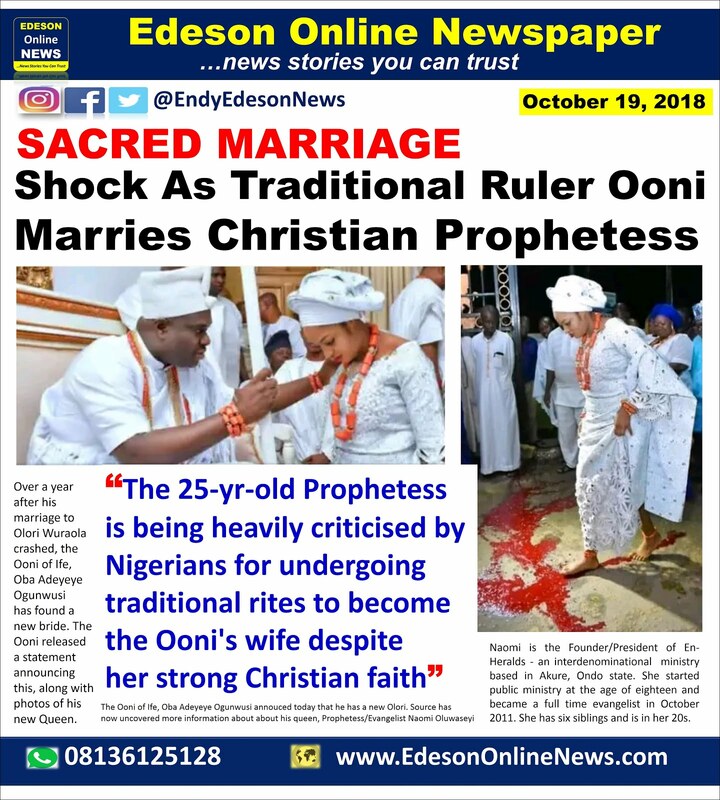 Nigerians have reacted to the pictures of her undergoing traditional rites to become the Ooni's queen despite her Christian faith as a prophetess. You want to tell me blood is not used for propitiation in d old testaments of the holy Bible? There has been no records of white, church wedding in the Bible. Traditional all d way! The Bible did not day we should abandon our tradition, but it only says we should not worship idols. Go to India, you will begin to wonder how many of the Indians will make heaven, because majority of them are Hindu worshipers. God has destined this lady to be queen. She wouldn't have ventured into the marriage if God had not spoken. Remember, she is a powerful prophetess who casts out demons. She started her ministry at age 18. Pls, there is a reason for the union. Hmhmhmh.It means she was not a true prophetess or evangelist as the case may be.Though the bible said we should not judge.but the same bible said;by their fruits we shall know them.There is no how oil and water will go togather,is very very unfortunate. Believe is a personal thing ,religion is a decision. If she decided to follow this way of live ,then is her choice. We don't know all own part of the story nd we don't 've to judge. She is still young and her happiness is wat dat count. People shouting evil and how it is unchristian. Do you know that if Nigeria was colonized by China you're likely to be a Buddhist? If India had colonized us you're all likely to be a Hindu? If it were to be the Arabs you're all likely to be Muslims? You all don't get it. You make it seem like you're the authority on God. You aren't. God is different depending on where you come from and do not make it seem like you own it. That's the problem with Christians and Muslims mostly. They want to monopolize God and make it seem like only their way is the right way. What makes you judge over the right way? Oh yes, the Bible and Quran. To the Christians, the Bible you all follow was written by humans. Don't tell me God revealed it to them if you can't prove it. I could come up with my own religion now and tell you God talked to me and still have followers. Let people practice what they feel is their best way of acceptance. We must know the different between culture and idolatry. Even Jesus told the ten lepers to show themselves to priests as Jews Culture demanded in their law. Some of us give goats, fowl, yams etc...during our wedding as each family culture demands. However, we must be very sensitive to know which one is idolatry (that Bible is against) and which one is culture. That's rubbish. Christianity is dead in Nigerian. It is only the Yoruba race that was not brainwashed in Nigeria by foreign religions they understand that the white man's God and angels are same with theirs but bear different names.Where the rest of us see division they see oneness and unity. She might be the Esther of our time going to the palace to get a reward for her people in Ondo who knows? She is pretty i would love to hear how they met o because being a prophettes i learnt they are usually on mountains praying maybe as events unfolds we will hear their meeting story.